First of, I would like to say a big thank you to the lovely Kirsty who blogs over at Something Crunchy Mummy for the nomination. You can read Kirsty's post here. I love joining in with things like this. It's a great way to know more bloggers and find new ones too! So let's get it started, with the rules! 2. Answer their 10 questions. 3. 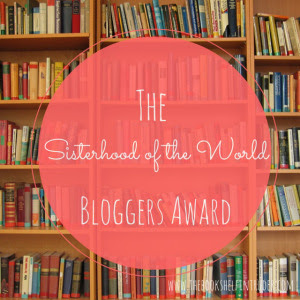 Nominate up to 10 bloggers for the award. 4. Give the nominated bloggers 10 questions to answer. The first blog I ever read was Kerry's over at OhSoAmelia, she really inspired me. I had originally saw an advert about Blogger on TV so since then I was really interested but then seeing someone local writing a blog, and so popular, I was just really interested to do one myself and somewhere I could document my family life. Something my girls will look back on one day, hopefully. 2. If you had no fear and could do anything, what would you do? I would love to jump out of a plane. I don't know why, but I think I would love that adrenaline feeling. The stunning views and would love experience it. 3. What's your favourite chocolate? Hmm... hard one! Galaxy or the Peanut Butter Kit Kat! 4. If you could take your family anywhere in the world, where would it be and why? Disney Land. I want to experience it myself and I want my girls to experience it. I'm a big tea lover! and a coffee hater! 6. What is your favourite TV programme? If I am honest, I don't read! But I remember reading a book when I was younger called 'About a Boy', that was good. 8. What is your signature dish? Urm, I'm not sure. To the people that know me in person, they know I love the Big Mac Slimming World. I like pastel colours. I don't have a particular one. 10. Who was the last person you spoke to? 1. What made you choose your blog name? 3. If you had one wish, what would it be and why? 4. What is your favourite take away? 5. Facebook, Twitter, Pinterest or Instagram? And why? 7. What do you do in the evenings once kids are asleep? 8. If you could give one advice to a first time mum-to-be what would it be? 9. If you could move anywhere in the world, where would it be and why? 10. To finish off, what one thing do you miss about the life you had before being a parent?